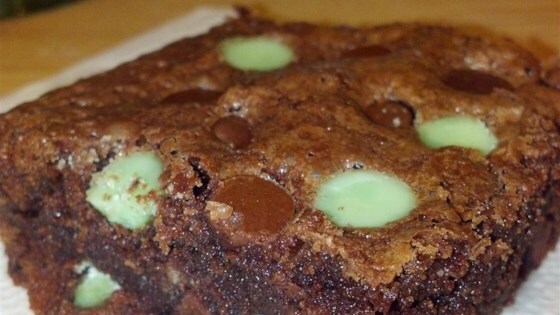 "This is the most awesome brownie that I have ever tasted!" In a large bowl, stir together sugar, eggs, oil, and vanilla until well blended. Combine the flour, cocoa, and salt; mix into the egg mixture until just moistened. Spread the batter evenly into the prepared pan. Sprinkle chocolate chips over the top. Bake for 30 to 35 minutes in preheated oven, or until brownies start to pull away from the sides of the pan. Allow to cool before cutting into squares. Oh my goodness...YUM! Other than mixing in 1/2 cup of chips in the batter, I followed the recipe exactly. They came out awesome!